Ask fellow campers about "Assateague Island National Seashore Campground" and nearby attractions. Stayed here for 2 nights, one night at A23 (back-in) and the second night at C43 (pull-through). A23 was level but needed to use levelers on C43. But the sites are really fairly flat. Beautiful area and, if you book ahead, there are beach sites. We did have ponies come through the campground on the first night -- didn't see any more until we were leaving and saw a herd crossing the parking lot on our way out. Pluses: location, beach, birding, wildlife, walking trails, good biking, can drive on beach with the right equipment and permit, peacefulness. Minuses: pit toilets (meaning don't pick a site next to bathrooms), bugs (some biting flies during the day, mosquitoes at night), most sites are not shaded. There are no hookups so you are bookdocking here, but they have a dump station and fresh water for your tank. There are generator free loops for those who want them, but also places you can use generator. We went in 26' trailer. We camped at Assateague Island National Seashore Campground in a Travel Trailer. This was a destination site. We only had 1 night but we scored a cancellation and got a second night in a different spot. With the America The Beautiful Pass it was $15 a night. Hard to get reservations and the sites are back in. Had to put the dolly & Toyota next to the RV but they did fit. Poor Verizon cell reception. Showers (not heated past solar), water spigots & vault toilets. Boardwalk access to the beach and a great beach at that! This is a great spot for the beach & the wild horses! Two nights are not enough. We'd come back! We camped at Assateague Island National Seashore Campground in a Motorhome. The wild horses roam here. I took some good photos of them and the sunrise! We stayed in a 33ft class C for 2 nights. We were on Oceanside loop 1, site 19. Yes there are horse dung piles around, but not as much as we expected. The sites are spacious and we were steps from the ocean! The mosquitoes were NO JOKE. I thought earlier in the year we would be okay, but no. They came through our screens so we had to keep our windows closed at all times. Which kinda sucked because I love the ocean breeze/sounds. They weren't bad by our fire pit which was where the breeze was, but anywhere the breeze was blocked (behind our camper where our outdoor shower was) you got attacked by hundreds! We also did the walking trails which were also nice and pretty cool! The horses were the highlight of course! They walked around the sites and they are beautiful! Kids loved it. Great experience. This was our first time camping around sand....and with 4 kids I don't think I want to again. Haha... I'll be cleaning for days! We camped at Assateague Island National Seashore Campground in a Motorhome. Bring bug spray, and long sleeves/pants for walks. We pulled off 3 ticks and we had 40% deet. The mosquitoes are REALLY bad except where the ocean breeze is blowing. VERY spacious sites and level. Good blacktop roads and site. Easy in/easy out, nice wide roads. Bathrooms are clean. It's a quiet campground (even with generators running during the day). The three trails are more strolls than "hiking" but we saw lots of horses and a few deer. 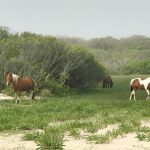 Awesome experience to see horses roaming around the campground, along the road, on the beach and in the marsh. We were here in off season. Don't think we'd want to see what traffic and congestion looks like in the summer! We enjoyed our stay here very much. Verizon and T-Mobile worked fine. Nightly rate doesn't include $10 transaction fee. We used the dump station and filled water on our way out - very easy. 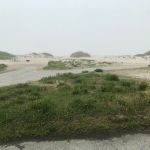 We camped at Assateague Island National Seashore Campground in a Motorhome. 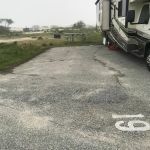 This is one of the best campgrounds on the Atlantic Coast, you can park Ocean front (with a dune in front of you), the ponies and deer wonder all throughout the campground. There are liberal generator hours. We went in March so there were plenty of campsites to choose from, however from April on you really must get your reservations 6 months in advance!!! The sites are level and large however sites are without services, but there are dump stations on both loops with potable water. We go in the winter or early spring, if you go in the summer be prepared to meet the real owners of the island (besides the horses) the MOSQUITOES. If you are properly prepared you will discover incredible beaches. If you want some recreation, Ocean City, MD is just a short drive away. This is a great campground, thus the 6 month advance reservations, need I say more. We camped at Assateague Island National Seashore Campground in a Motorhome. Superlative. Our best camping experience ever. The beach, the ocean waves, the horses, the birds. We even saw a seal sunning himself on the sand. We saw horses every day. The sites are very spacious, water and trash close by. Cannot see the ocean but you can hear the surf just over the dunes. We stayed one night on the bay side, where you can see the water, which was shallow and warm. But the bay side is very buggy, you will need repellent. The park rangers were fabulous, very friendly and willing to chat and answer all your questions. The "Pony Patrol" shows up with the horses to keep everyone safe - despite this, people manage to get bitten or kicked by being stupid. So don't be stupid. Also, put your food or anything that will even seem to be food to a horse (soap) away if you leave during the day. We saw two campsites raided by horses because people left things out. 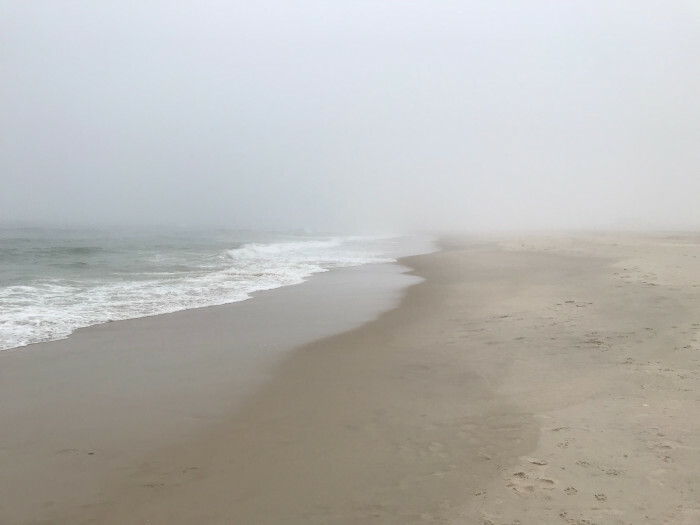 We camped at Assateague Island National Seashore Campground in a Travel Trailer. We camped on the bayside-Site 13 A loop (generators allowed). No hookups. Large site and not far from the bathrooms. You are not far from the ocean (walking distance) but drive if taking a lot of stuff. Clean large showers (only cold water). Large, clean bathrooms (vault). Lots of mosquitoes but we had a screened in tent we sat in. Horses walked through our campground numerous times. The only bad part was the septic was full when we went to dump on our way out. Had to drive over to the ocean side to dump. We camped at Assateague Island National Seashore Campground in a Travel Trailer. There are 2 sections to the campground - beach and cove. We chose cove as we travel with a dog and wanted grass for him to run on. Sites are paved and back ins. Some sites overlook the marsh / cove, but there are great views no matter which site you take. The toilets are pit toilets but they were fairly clean. The area is teaming with wildlife - one evening we had 3 deer and 2 horses grazing in the grass behind our rig. Just watch your step because there is poo everywhere. All sites are without services, but there are dump stations on both loops with potable water. 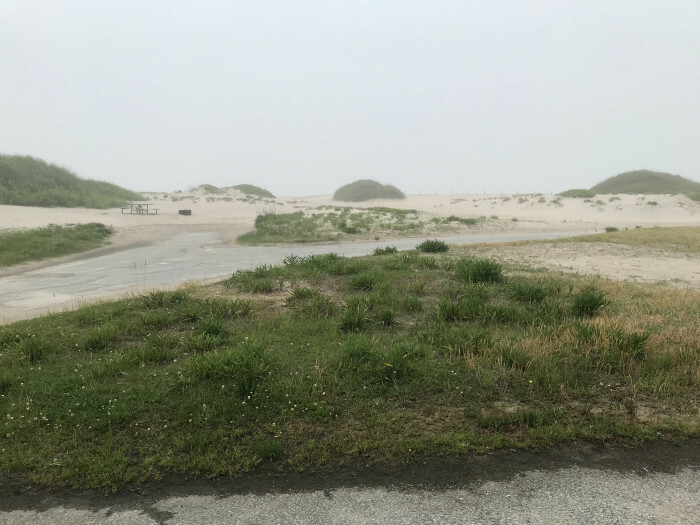 We camped at Assateague Island National Seashore Campground in a Truck Camper. Fabulous biking / walking paths through the park. Lovely stay Easter Weekend at the park. It was during the visit the National Parks for free weekend so as we traveled south we decided to take advantage of the fee free weekend. Nice view of the bay even though we were on the inner loop and the horses came right on our site. Our fisherman caught 8 Rock fish (Striped Bass) on the bay side. Great Easter sunrise service at the State Park. Our Verizon coverage and hot spot worked well. The major drawback for the weekend was the lack of sanitary facilities being open. The campground was full, however, the toilet facility in our loop A only had one "hole" open. The other doors were locked. Not a problem for us because we brought our own but we saw tenter's taking toilet paper into the bushes. If the park is open for business, the toilet facilities should be available for the crowd that showed up. We camped at Assateague Island National Seashore Campground in a Motorhome. Visit the Visitor's center, take the marsh boardwalk trail. Ride your bikes and kayak. So much to do! Park was very well run and just what the doctor ordered. Peace and quiet in a natural setting. Price reflects senior discount. We camped at Assateague Island National Seashore Campground in a Travel Trailer. April was a pretty good time to visit here. No bugs; decent weather. But it was windy the whole time, and when it rained and was cold (one day) it was pretty miserable. Be prepared. Love going to Assateague! Beautiful scenery, beautiful beaches, quiet, clean...love it! 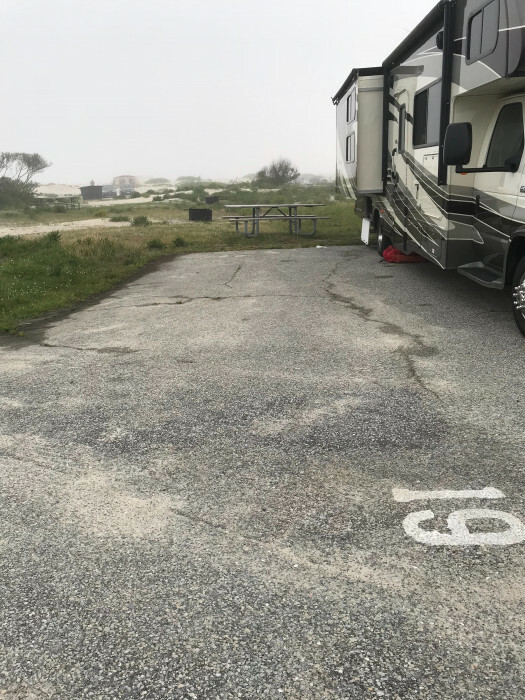 We camped at Assateague Island National Seashore Campground in a Motorhome. The park is an amazing experience. The beaches are super... It's important to note if you haven't been here that there are no hook ups ! Generators are used heavily. We used ours and many people used theirs. There are generator free loops available. I can't say generator usage bothered us and given the hot weather we experienced while there I don't blame anyone for using one. They must be shut down at 10 PM and may resume at 6 AM. The park is very large and it's easy to find seclusion and quiet areas. There is a visitors center prior to entering the park. (This is not the check in office). Also, there is a second park within the large park operated by the State of Maryland. They have a similar campground too and both the federal park and the state park basically share the same roads and beaches. You will see the wild horses and experience nature... bring your bikes! We camped at Assateague Island National Seashore Campground in a Travel Trailer. We stayed on the bay side, expecting to be eaten alive by the infamous mosquitos. Actually, it wasn't bad. There were bugs but a liberal application of OFF! seems to hold them at bay. The site we had was A6, in the generator loop. We only ran our genset for battery charging and coffee and microwave use. Be aware that the NPS does NOT enforce the noisy generator rule (can't be over 60 decibels at 55' from campsite or something to that effect), there was a guy clear on the far side of the campground with one of those cheap construction type generators that ran it ALL DAY LONG, until 10pm. It was very loud and distracting. The site was more or less level and asphalt paved. It backed up to the tree line which was nice. "Wild" horses cruise throughout the campground at will. They like to hang out around the bath house for some reason. We did not use the cold water showers or the pit toilet bathrooms. All in all we enjoyed our 4 night stay, the beach is wonderful. You can rent kayaks bayside or sign up for a kayak tour. I would have given this a 10 star rating if the rangers or camp host had enforced the generator noise rule. Price reflects 50% NPS Senior Pass rate. We camped at Assateague Island National Seashore Campground in a Motorhome. Bring sunscreen and bug repellent!!! We had a beautiful site with excess to the bay side for swimming & kayaking. Interior roads and sites that we noticed were asphalt. All sites are dry. Bathhouses very clean but only cold running water for showers. Pit toilets only. Horses & deer make frequent visits. Park rangers make routine patrols. Campground & park great for biking and kayaking. Bayside campsites has more small tree growth which offer some shade. Good signal on our Verizon. Would certainly return again or recommend this place to anyone. 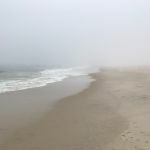 We camped at Assateague Island National Seashore Campground in a Travel Trailer. Very clean park. Bathrooms were clean, but primitive (only pit toilets). Showers were clean but only cold water (which actually feels great, considering you will likely get sunburned at the lovely beach!). Sites were kept clean, though watch for the horse poo. Wild horses roam free around the park, but are not a nuisance provided you keep your food put away and watch what you cook when they are near. Some sites are bigger than others, but all should accommodate larger rigs. Roads are all paved. The park is minutes from Ocean City, Md. The park also has two beaches, which are kept clean and family friendly. Zero hookups at this park. Would definitely come back! We camped at Assateague Island National Seashore Campground in a Tent Trailer. 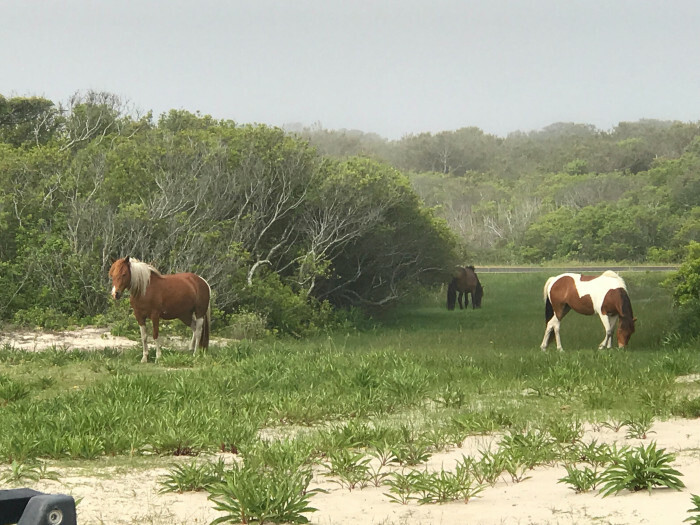 Are you affiliated with Assateague Island National Seashore Campground ?